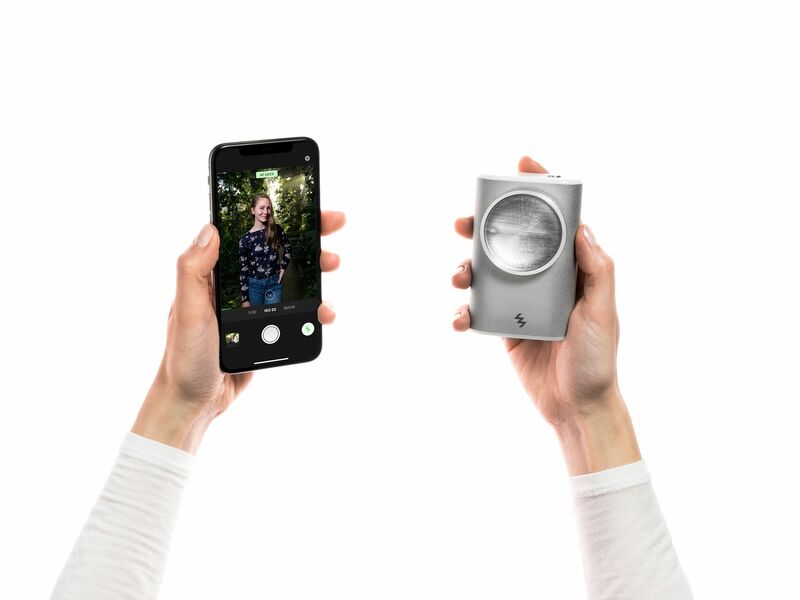 Those who want to experiment with external light sources in their smartphone photography have a fairly wide range of LED-powered lights to choose from. Things look a lot different though if it is a good old-fashioned xenon flash you are after. 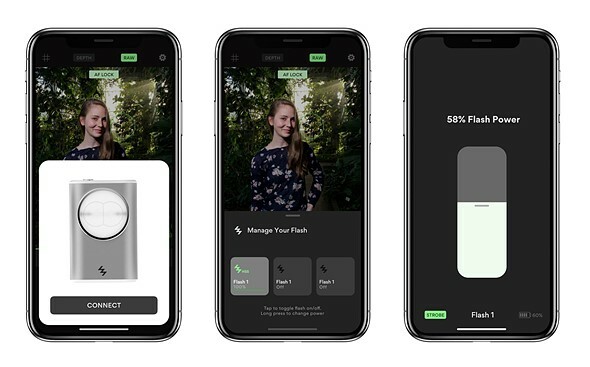 The same people who brought us the Lumu light meter are now planning to change this, by launching a crowdfunding project for the LIT smartphone flash on Kickstarter. The LIT is a xenon flash with 40W power output and a built-in 2800 mAh Li-Ion battery that is good for 200 full-power flashes. It is capable of High Speed Sync (HSS) and works with smartphone shutter speeds from a few seconds to 1/10,000 of a second. 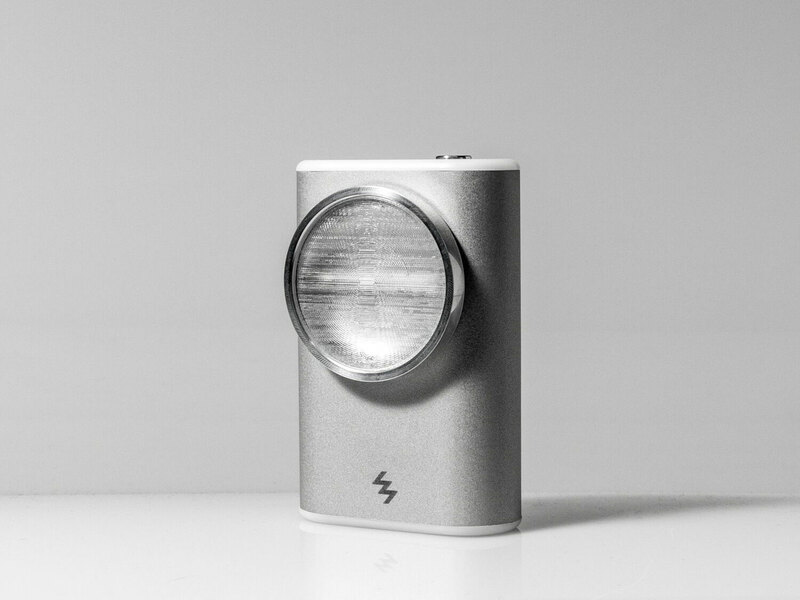 The flash communicates wirelesslessly with your device via Bluetooth and up to four flashes can be controlled separately via a dedicated mobile app. You can also trigger the camera shutter remotely by pressing a button on the flash. The unit comes with a 1/4” tripod thread and a bayonet accessory mount. It's compatible with newer iPhones and Android devices. "By adopting good mobile app design principles, we will empower people with no previous flash photography experience just as much as more proficient photographers”, says Marko Pirc, LIT Vision co-founder and Head of Product. If you would like to see what kind of results are possible with a LIT flash you should check out the LIT gallery on Flicker. Pledges on Kickstarter start at $179 and shipping to backers is scheduled for January 2020. The expected MSRP in regular retail is $329. For more information and detailed pricing head over to Kickstarter. Disclaimer: Remember to do your research with any crowdfunding project. DPReview does its best to share only the projects that look legitimate and come from reliable creators, but as with any crowdfunded campaign, there's always the risk of the product or service never coming to fruition. Great idea, but pricing is too "greedy". It'll only be time before someone else like Xiaomi beat this by offering similar solution/product at one tenth of your MSRRP. Even at the Kickstarterpricing, I do not see how it is enticing let alone the risk of this project folding. You're not an apple yet, but already are commanding the apple price. I kind of fail to see the point of having a separate flash for my phone, especially when they want over 300 bucks for one. Why not design a flash trigger (like a transmitter/receiver kit) for the phone instead so one can use any standard speedlight with it? Hi , it's Marko from LIT here. 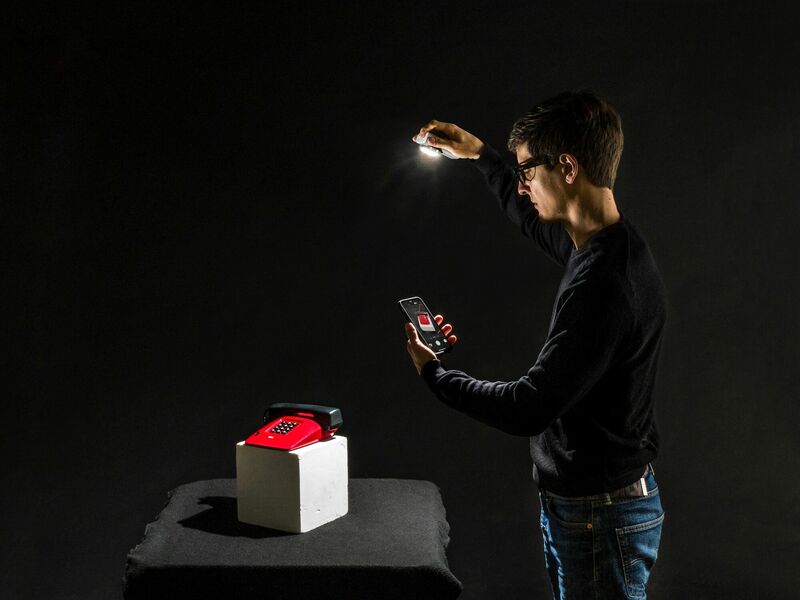 Standard speedlights wouldn't work with your smartphone at exposure times shorter than approx. 1/60 second. Which means if you shoot pictures anywhere outside of dim to averagely-lit rooms, your photos would be only overexposed. In case of any other questions, I'm here. Thanks, Marko. II size is almost as big as mirrorless camera like Nikon 1 or Sony RX100 series in which will give much better image quality, much better control than any smartphones. This looks like quite professional quality. Wish somebody would design something similar but much cheaper for the common guy/girl. I can buy 6.5 LIT for the cost of 1 Broncolor L https://www.bhphotovideo.com/c/product/1250562-REG/broncolor_b_31_710_07_siros_l_400ws_battery.html The way I work 2 will be enough—looks like a bargain to me. Retail price will be $330.....and you can link four of them. Are they completely out of their minds? Me! But I only need 2. So for $329 my iphone can catch up with my 7 year old nokia that had a xenon flash built in. I'm interested in this, and yes I have a "real" camera and decades of pro experience. I consider the iPhone a serious camera. I have both versions of the Godox flash, they are hampered by a max sync speed of 1/45 second and mediocre apps. If this company has figured out how to sync at hight speeds, I'm in. Hi psartman, it's Marko from LIT here. The late Ansel Adams photographed former president Carter using a huge Polaroid camera, for his official portrait. LIT must be hoping that Trump's official portrait will be taken with a mobile phone!!! "The unit comes with a 1/4” tripod thread...". So somebody who goes to the trouble of mounting it on a stand/tripod, then takes the precious photo with a mobile? The design reminds me of 1980s front bicycle light, and that was crap too. I used to bicycle commute. A front light saved my life several times. Things 99,9% of people dont need and 75% of them have it lying around within a week or two. Nice looking and powerfull, but I believe there's Godox A1 / Ami for a fraction of the cost. Much less power, but still enough to trigger other lights or for single-flash portrait / product photography. The bigger question is the camera app, because the Godox app didn't exactly impress with image quality on my Note 8. Hi Oleg, Johan, it's Marko here from LIT. Please let me know in case you have any other questions! it's Marko here from LIT. LIT Flash power is 40 Ws which is equivalent to Guide No. ~32. "The expected MSRP in regular retail is $329"
IF Acer was wiser and further develops its Zen Flash, there'd be no joking news like this. For $300, one could buy good 1" compact camera. It may be somewhat out-of-date, but smaller than this flash and less clumsy. We badly need flash that can illuminate buyer's eyes. its tiny well built and oh it cost 29 dollars for goodness sake 4.5 stars of 5 with 21 reviews a full 300 usd bucks less ...what? I agree with you. But, If you take photos at 1/100s exposure time (pretty standard duration), LIT Flash will produce slightly more than 100-times more light than 2000 Lumen LED (the one form your link doesn't have this info stated). For $329 I can get a really nice pro-grade flash for one of my real cameras, use it to take a good picture, then Bluetooth transfer said good picture to my phone. Add-on lenses, grips, cases, external lights - Wonder when someone will make a gadget bag for cellphones and all the accessories - or have they already? Yes, you beat me to it. And don't forget a Polaroid filter, an ND filter, a lens shade, a gimbal for video, tripod. Then the light stand, umbrella, soft box (all these for selfies) ... . It's all downhill from here, the end of the smartphonecamera madness. And of course user experience part: ease of use, enabled by tight software and hardware integration. Yup, I just looked at the Tric video/web site listed above and the Tric is not a TTL solution. That means you need to manually adjust the flash output. OK, so now you have to take flash pictures via trial and error or bring a light meter with you. The latter is a ludicrous proposition, so it means trial and error to make this work. Tric is a much less expensive option, but it's also much less convenient. Not my cup of tea. "The expected MSRP in regular retail is $329." Ouch. You could get a decent used camera (or a new YI M1) and a Godox flash gun for that kind of money. Looks very uncomfortable to hold one in each hand. But almost all add on mobile phone camera gadgets are awkward. So why not this one. However, the Godox 36 is only about $19, so I see no need for this flash in my life. I'm sure it's brighter, but I don't need any brighter than my little Godox LED light. If I do, now there's a $29 version that has more LEDs and light output. No offense to those who do, but just not for me. I hope they would stick to the facts. I fail to see how the first photo is taken, certainly not with the flash on the table. So maybe with an other similar unit out of the picture? I do not think they can synch the flash with BT, no way. So likely it stays on for 1 second or so, i.e is more bluetooth controlled light. That is cool, but why the need to make it look like something else than it is. Bluetooth flash? Most of the time I can't even sync my BT keyboard with my tablet without something messing up, how do they intend to to sync a flash over BT? I use a Sennheiser HD1 In-Ear Wireless Headphones, Bluetooth 4.1 with my iPhone XS. NO big deal. Been waiting for this from a company that has both made wireless flashes and phones (Sony, Samsung). Such an obvious improvement for a small sensor high-resolution camera. Unfortunately, it faces the same convenience issue as standalone cameras. Phone is always with you. This thing - you have to remember to take. It's also quite expensive - almost as expensive as an 1" camera with xenon flash (Canon G9x). Tough sell. I'm having a hard time imagining the person who uses a smart phone to take his/her pictures also being willing to cart around even fairly compact attachments (lenses, etc.) much less something every bit as bulky as their smart phone. But hey, maybe I just have too limited an imagination. It's weird but some people are totally willing to completely encase their phone with camera accessories in order to get an image that will be crappy anyway, with the kind of effort that makes proper photography look trivial, costing more than a decent ILC (just look at this $330 flash), weighting more, with ridiculously horrid controls. But hey at least they need to use an external battery pack in order to be able to use the franken-camera for more than half an hour so that's a win I guess? I have no problem imaging using 2 LIT for product shots. BTW the output of an iPhone XS is good enough to publish in a glossy magazine. Doing a google search I found a company named Tric with a solution already shipping for $58+shipping that you can can pair with an existing flash unit you own, or you can buy a cheap generic flash like a Yongnuo for a total solution cost of around $100. Not as clean/portable as what LIT is proposing but an alternative nonetheless. If someone cares enough about a photo that he wants to use an extra light I would say he wouldn't use a smartphone in the first place. BUT more and more young people are using a phone as their primary camera. Full stop. So this flash is something that may be useful to them. A mobile phone might be a perfect camera to bring with you in many cases. But ... as soon as you want auxiliary stuff, you know you are on the wrong track.